The lightweight Cloudflow shoe by On is made with 18 "Clouds", independently cushioning your every step. Precisely positioned with unique Zero-Gravity EVA foam, this shoe is equipped for all sorts of running experiences. The Cloudflow also features a larger central channel, engineered mesh upper and reflective logos, plus a no-sew construction so you stay comfortable. From a simple idea came a Swiss running shoe that has revolutionised the world of sports footwear. 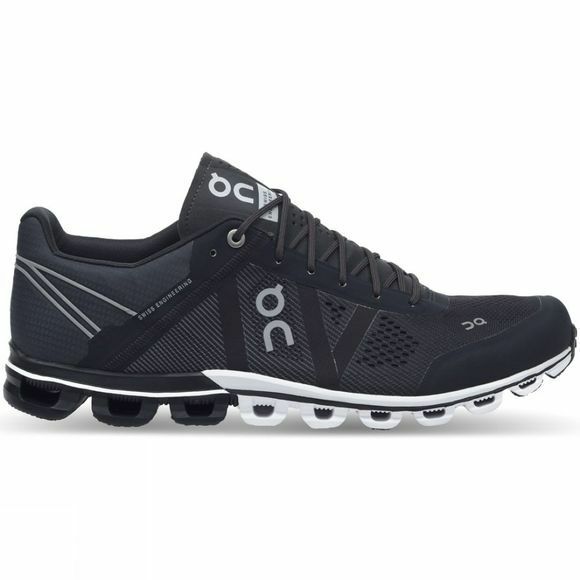 The On provides a new running sensation, and one that puts fun firmly centre-stage. The concept behind the design was simple: cushioned landing, firm take off. But the result was a truly unique running sensation that quickly one ON a cult following of devoted wearers. Today, the ON shoe is available in more than 25 countries and has multiple international design and technology awards to its name.